If you are a resident or run a business within a residential parking zone, you can apply for permits and coupons that give an exemption from parking restrictions. The information on this page is for the residential parking zones listed below. Select the area to see a map and a list of streets in the zone. Arch Hill residential parking zone permit went live 7 December 2018. Bond Street (part of), Brisbane Street (part of), Commercial Road (part of), Cooper Street (part of), Dean Street (part of), Home Street, Keppell Street, King Street (part of), Kirk Street (part of), Monmouth Street (part of), Niger Street, Partridge Street, Potatau Street (part of), Seddon Street, Waima Street (part of). Download a map of the Arch Hill residential parking zone (PDF 98KB). Freemans Bay residential parking zone permit renewal is 14 November. Anglesea Street, Arthur Street, Barrie Street, Beresford Street Central, Beresford Street West, Collingwood Street, Costley Street, Elizabeth Street, England Street (excludes east kerb between College Hill and Runnell Street), Franklin Road (part), Georgina Street, Grattan Place, Gunson Street, Gwilliam Place, Hayden Street, Heke Street, Hepburn Street, Howe Street (north of Beresford St Central), Ireland Street (part of), Margaret Street, Middle Street (south kerb), Napier Lane, Napier Street, Paget Street, Pember Reeves Street, Picton Street, Pratt Street, Renall Street, Russell Street, Runnell Street (south kerb), Ryle Street, Sheridan Lane, Smith Street, Spring Street, Tahuna Street, Wellington Street, Winn Road, Wood Street. Download a map of the Freemans Bay parking zone (PDF 125KB). Grafton residential parking zone permit renewal is 16 July. Arotau Place, Boyle Crescent, Carlton Gore Road, Claremont Street, Glasgow Terrace, Huntly Avenue, Outhwaite Lane, Parkfield Terrace, Park Avenue (part of), Park Road (part of), Seafield View Road. Grey Lynn residential parking zone went live 7 December 2018. Ariki Street, Arnold Street, Beaconsfield Street (part of), Chamberlain Street, Cockburn Road (part of), Coleridge Street (part of), Crummer Road (part of), Dickens Street, Dryden Street (part of), Elgin Street (part of), Farrar Street, Grosvenor Street (part of), Harcourt Street (part of), Jessel Street, Julian Street, Leighton Street, Mackelvie Street (part of), Millais Street, Murdoch Road (part of), Northland Street (part of), Richmond Road (part of), Rose Road (part of), Scanlan Street (part of), Schofield Street (part of , Selbourne Street (part of), Sussex Street (part of), Turakina Street (part of), Wallingford Street, Williamson Avenue (part of). 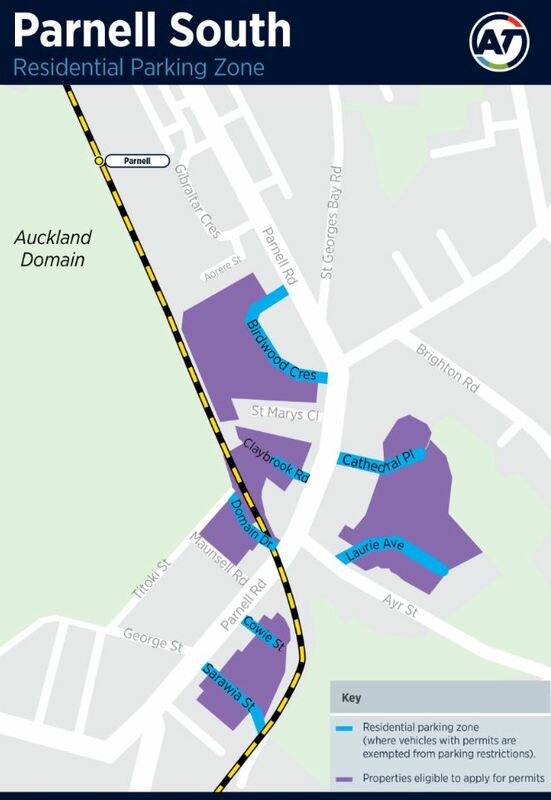 Download a map of the Grey Lynn residential parking zone (PDF 122KB). Mt Eden residential parking zone permit renewal is 3 October. Brentwood Avenue, Edenvale Crescent, Edenvale Park Road, Graysons Lane, Horopito Street, Kawaka Street, Kelly Street, Punga Street, Sylvan Avenue East, Sylvan Avenue West, Wright Spur, Wynyard Road. Download a map of the Mt Eden parking zone (PDF 122KB). Parnell residential parking zone permit renewal is 18 December. Alberon Place, Alberon Street, Avon Lane, Avon Street, Balfour Road, Bridgewater Road, Burrows Avenue, Canterbury Place, Cleveland Road (part of), Corunna Avenue, Gladstone Road, Judge Street, Judges Bay Road, Rota Place, St Georges Bay Road (part of), St Stephens Avenue (part of), Staffa Street, Stanwell Street, Stratford Street, Taurarua Terrace. Download a map of the Parnell parking zone area (PDF 32KB). Parnell Central residential parking zone went live 18 March 2019. Aorere Street, Bath Street, Bedford Street, Bradford Street, Cracroft Street, Churton Street, Earle Street, Garfield Street, Gibraltor Crescent, Heather Street, Ngahere Terrace, Ruskin Street, Scarborough Terrace, Windsor Street, York Street. View larger version of map. Parnell South residential parking zone goes live 6 May 2019. Birdwood Crescent, Cathedral Place, Claybrook Road, Cowie Street, Domain Drive, Laurie Avenue, Sarawia Street. Applications for permits and coupons can now be submitted. Please note that submitting an application for a residential parking zone permit does not exempt the vehicle from parking zone restrictions. Parking zone signs and restrictions must be adhered to until the parking permit has been approved and activated, or the vehicle may incur a parking fine. 28 April 2019 - Application due date. Please submit your application(s) by 28 April to ensure they can be processed before the residential parking zone goes live. Applications received after this date may not be approved by the zone go-live date. 29 April to 3 May 2019 - Application review. We will contact you during this time to let you know if your permit(s) and/or coupon(s) have been declined or approved. 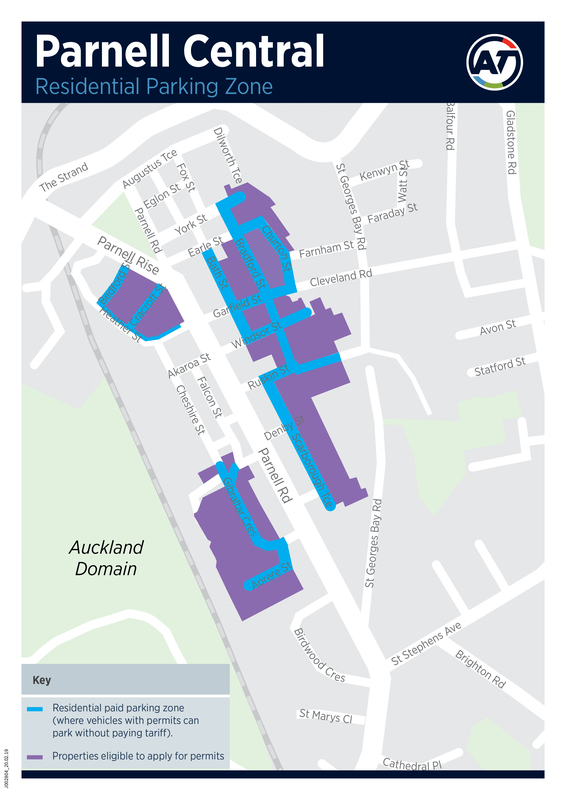 6 May 2019 – Parnell South residential parking zone goes live. Ponsonby residential parking zone permit renewal is 19 June. Bayard Street, Brown Street, Clarence Street, Cowan Street, Douglas Street, Fitzroy Street, Islington Street, John Street, Kent Street, Lincoln Street, Mira Street, Norfolk Street, O'Neill Street, Pompallier Terrace (between Ardmore Road and Redmond Street), Ponsonby Terrace, Prosford Street (between Provost and Blake Streets), Provost Street, Richmond Road (between Lincoln and Scanlon Streets), Scott Street, Sheehan Street, Stuart Street, Summer Street, Tole Street, Vermont Place, Vermont Street. Download a map of the Ponsonby parking zone area (PDF 104KB). St Marys Bay residential parking zone permit renewal is 19 September. Cameron Street, Caroline Street, Dedwood Terrace, Dublin Street, Dunedin Street, Green Street, Harbour Street, London Street, Melford Street, New Street, Selby Square, Seymour Street, St Francis de Sales Street, St Marys Road (numbers 19, 21, 24-89), Vine Street, Waitemata Street, Yarborough Street, Hackett Street, Swift Avenue, Ring Terrace. Amiria Street and Percival Parade. Download a map of the St Marys Bay parking zone (PDF 109KB). Apply for or renew residential parking zone permits and coupons online. Please note that you cannot apply for permits or coupons via the AT Park app. Please note that submitting an application for a residential parking zone permit or coupons does not exempt the vehicle from parking zone restrictions. Parking zone signs and restrictions must be adhered to until the parking permit has been approved and activated, or the vehicle may incur a parking fine. Log in to your MyAT account or create MyAT account. If you have a registered to use AT Park or have a registered AT HOP card, then you have a MyAT account. Log in using your email address and password. The residential parking permit service is part of AT Park. When you are registered with AT Park you can use it to apply for and manage your permits, and use the AT Park app to pay for parking around the city. When logged in to your MyAT account click on ‘Parking permits’ in the AT Park section. Click on button to continue to the parking permits application form. On the permits info page, click on the button to continue. Complete the AT Park registration form. The form includes entering your credit or debit card details. Payment will only be taken from your card when a permit is granted or coupons are purchased. We will email you before payment is taken from your card. When applying or renewing permits or coupons you will need to attach proof of residency and confirm you have read the terms and conditions. If you don’t have all the details to complete the application, you can save the application and come back to complete it when you are ready. In the permits system, from the menu select Parking permit business or resident. From the dropdown menu, select the permit for your area. Complete the application form - if applying for multiple vehicles, you need to complete an application for each vehicle. Residents can apply to receive just their free coupons without applying for a permit. Businesses can apply for coupons without applying for a permit. From the dropdown menu, select coupon book option. When approved you will be able to use your free coupons and buy additional coupons. Eligible residents can apply for permits. Eligible businesses may apply for 1 parking permit. The permit fee is $70 per vehicle. Permits are valid for 1 year, or part thereof. You can update your credit or debit card details via our website or the AT Park app. Log in to your MyAT parking permits account to update or complete your permit or coupon application. When you log in to your MyAT account, you can generate a tax invoice for paid permits and coupons. We will consider transferring a permit to another vehicle, eg. If you have purchased a new vehicle. Contact us in writing to request the transfer of a permit to another vehicle. Please provide your name, address, contact number, permit number (if known), old and new car registration numbers, and make and model of the new vehicle. If the transfer is accepted, you will be notified that the replacement permit has been activated. To request cancellation of a parking permit, Contact us in writing to request the change. Please provide your name, address, contact number, permit number (if known) and car registration number/s. No refund can be provided for any unused time on the permit, as the permit fee is not monthly pro-rated, customers pay a yearly flat fee. Once the cancellation has been processed you will be notified. Coupons are digital (paper coupons are not provided). Coupons are for 1 day, and are valid for one calendar day when activated. Eligible residents can apply to receive an allocation of 50 free coupons in each permit year. Residents can apply to receive just the free coupons without applying for a permit. Businesses are not eligible for free coupons. Additional coupons can be purchased by eligible residents and businesses for a fee of $5 each. Refer to the apply section above to apply for coupons, and refer to the information below to use coupons once they have been granted. Coupons can be activated and cancelled via the AT Park app and AT website. 1 day coupons can be used for your vehicle and visitor vehicles. You will need to know the vehicle licence plate number to use coupons. When your application for coupons has been granted, you can use your 1 day coupons. To use this option. you will need to have the latest version of the app. If you confirm the use of a coupon today it cannot be changed or cancelled, and the used coupon cannot be returned or refunded for use later. If you confirm the use of a coupon for tomorrow or in the future, the coupon details can be changed and cancelled before the day of use. When applying for permits or coupons, proof of residence must be supplied. If your application is successful, we will then process your application. Proof of residence is required for all permit and coupon applications. Generated bill dated within the last two months, eg power or internet bill. Electoral roll letter less than 3 months old. Recent tenancy agreement that clearly shows your name and full address. Water or rates bills are not accepted as they confirm ownership, not residency. Property documents, such as Title papers and Sales and Purchase agreement. We will process your application and contact you to let you know if your permit(s) and/or coupon(s) have been approved. The processing of your application may be delayed or declined if the correct information or proof of residence is not provided. Site inspection and investigation may be undertaken by Auckland Transport prior to approving permits. Submitting an application for a residential parking zone permit does not exempt the vehicle from parking zone restrictions. Parking zone signs and restrictions must be adhered to until the parking permit has been approved and activated, or the vehicle may incur a parking fine. When you use our online service to apply, you will be required to enter credit or debit card details. Payment is only taken from your card if your application is successful. If your application is successful, we will notify you by email before payment is taken from your card. If your application is successful and payment has been made, we will send you a confirmation email that your permit has been activated. Residents and businesses within Residential parking zones can apply for residential permits and coupons. Each residential parking zone operates on a set annual cycle. Permits are valid for the year of the set annual cycle date range. Annual permits approved will be valid for 1 year, or part thereof, until the end of the annual cycle date range. The full fee is charged, regardless of when the application is applied for during the cycle. A residential parking zone is an area with a time-restriction that applies to on-street parking spaces across a residential area. The time restriction for parking spaces within the zone is typically 2 hours, Monday to Friday, 8am to 6pm (excluding public holidays). Subject to eligibility, residents and businesses within the zone can apply for permits that give an exemption from the parking restriction. Residential Parking Zone parking permits do not guarantee permit holders a parking space in their street. If you live within the zone, you can apply for as many permits as there are vehicles registered to your address. Because the number of permits is capped, you may not get all the permits you apply for. If you run a businesses within the zone, you can apply for 1 permit. New developments and homes built after the notification of the Auckland Unitary Plan (30 September 2013) are not eligible for parking permits. This is to protect the sustainability of the parking schemes and stop developers passing on the costs of providing parking to ratepayers. Developers and new home builders have a responsibility to ensure they have sufficient off-street parking to meet their needs. To ensure parking spaces are available, the number of permits issued is capped at 85% of the total number of spaces in the zone. Permits are allocated 1 at a time in rounds based on a priority system. If you are a resident applying for multiple permits, you will only be able to receive 1 permit in each allocation round. The allocation process stops once the permit cap is reached or when all applicants have received a permit. House on a single title without off-street parking or an apartment building built before 1944 without off-street parking. House on a single title with 1 off-street parking space. All other house or townhouses. Community groups, school, education provider. Businesses located within the parking zone. The annual permit or daily coupon may only be used in the parking place that is defined as part of the residential parking zone and is not an authorised vehicle for the purpose of any other authorised vehicle parking place on the Auckland Transport system. The annual permit and daily coupon exempts the vehicle from the parking restrictions operating within the signed boundary of the residential parking zone. Vehicles parked on the road without a valid parking permit and which exceed the permitted maximum time of parking, without moving while the residential parking zone is in operation, may receive an infringement notice. The parking scheme operates on a "first in, first served" basis and does not guarantee the availability of any parking space. The permit does not exempt the driver from parking laws or general parking restrictions imposed by the Road user Rule (for example, no parking over a driveway, no parking within 6m of an intersection) or the Auckland Transport Traffic Bylaw 2012. The permit does not apply to any prohibited or no-stopping areas such as bus stops, taxi stands, mobility parking bays, clearways or where there are broken yellow lines. This also applies to any other timed parking restrictions within the residential parking zone. An authorised vehicle for an annual permit must not be a trailer, boat, caravan, truck, bus or tractor. An authorised vehicle for a daily permit must be a passenger or commercial vehicle under 3 tonnes. The permit is not transferable to another vehicle without the prior agreement and approval of Auckland Transport. Auckland Transport must be notified by the permit holder when they cease to reside at the address given in the corresponding permit application. The permit is for personal use and will be revoked if the permit is directly or indirectly used for commercial purposes. Auckland Transport reserves the right to revoke this permit / daily permit at any time and without reason. Call us 09 528 7275 or use our feedback form.